University of Chicago professor Angela Olinto. 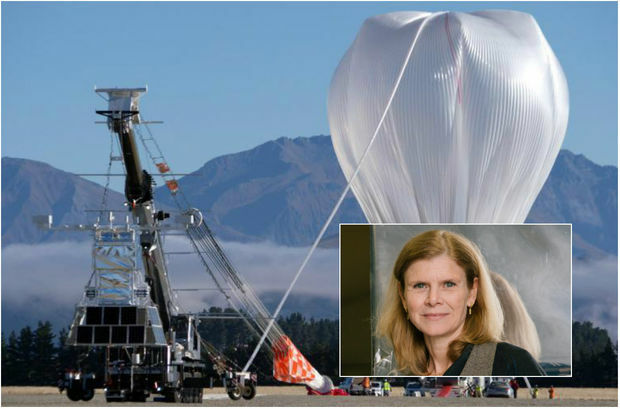 The balloon, reportedly "stadium-sized" when fully inflated, features a telescope that will take 400,000 images a second using an ultraviolet camera that scientists at the U of C and around the world will use to study the cosmic rays. The launch this week from Wanaka Airport in New Zealand was the eighth attempt after seven previous efforts were blocked by weather. Researchers from 16 countries helped design and build the 18.8-million-cubic-foot balloon, made of polyethylene film. It is expected to circle the Southern Hemisphere for 100 days, at about 21 miles above the earth, breaking the previous flight record of 46 days, set in 2016. Follow the balloon's route here. The project, known as the Extreme Universe Space Observatory on a Super Pressure Balloon (EUSO-SPB), is funded by NASA with the U.S. team led by the University of Chicago. Scientists will use the information to study cosmic rays penetrating the atmosphere. Two U of C undergraduate students, Leo Allen and Mikhail Rezazadeh, have contributed to EUSO-SPB by building an infrared camera to observe cloud coverage at night. A professor in the department of astronomy and astrophysics, Olinto holds a doctorate from the Massachusetts Institute of Technology.